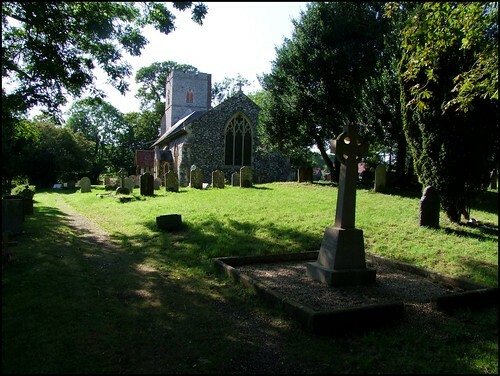 The setting of this small church is delicious and idyllic, in what is in any case one of the loveliest parts of East Anglia. It is set a few hundred yards off of a minor road across a meadow beside the gentle Brett, in a hilly, tree-surrounded graveyard still higgledy-piggledy with 18th and 19th century memorials. The village, such as it is, is a scattering of old houses to south and west. The church is almost entirely Victorianised, but this doesn't really matter, because this is a place which feels as if it has been in a deep sleep for far longer, and it is redolent with a sense of the past, a touchstone down the long Semer generations. A striking feature is the marble Edwardian angel scattering roses to the east of the church, which was illuminated by the suns rays slanting from beyond the tower as we walked up from the gate. I hadn't been here for years. On my last two visits I had been unable to see inside, because it was locked, but these days, Suffolk churches are mostly open every day. Perhaps, as in other things, Semer is a little behind the times, but there is at least now a keyholder notice, and there is a key available from the famous Hollowtrees Farm Shop on the Hadleigh to Stowmarket road, about a mile to the west. My heart sunk slightly when I saw the long queue for the counter, but the staff were very efficient and helpful, especially, as I discovered when I got to the front of the queue, when they couldn't find the key. Phone calls were made, and it turned out that someone had collected it to clean the church the previous day and not brought it back. However, the farm shop is owned by one of the churchwardens of Semer, a very quietly-spoken man to whose cottage I was directed a little further down the road towards Hadleigh. He had another key which he willingly lent us, and so we headed back down the lane and across the meadow. It was now later in the afternoon, and the little church was beautifully illuminated from the west by the setting sun. A quick tour of the outside of the church first. I was surprised by the unusually placed chest memorial a few feet to the north of the chancel, its inscription facing the wall. The answer to this puzzle is that the chancel was rebuilt in 1870. The old one which it replaced must have been very small, or perhaps it had vanished altogether in the years between the Reformation and the late 19th Century. The tomb is to 18 year old Maria Archer, who died in 1786: This amiable young woman was blest with an uncommon sweetness of disposition, a refined and highly cultivated understanding, and a most striking urbanity of manners, which sounds as though it might be a quote from a BBC costume drama. Even more curious is the newly carved headstop on the east side of the south doorway. It reminded me of someone, but I could not think who. We stepped down into a small interior which felt rather overcrowded. It was fitted out for High Church worship by the late Victorians, and the furnishings are of the highest quality, all set on a sea of the shiniest tiles. A smell of polish pervades throughout. Survivals of the pre-Victorian era are rather marginalised: the best are two panels of Moses and Aaron which now flank the reredos. The boards which used to be between them are now set on the west wall of the nave, either side of the tower arch. The one on the south side appears to have been reframed. In front of the arch is another of those blockish, primitive Norman fonts which seem so common in these parts. Overall, I was struck by the intimacy of the space: it would not be hard for this church to seem full, and a candlelit evensong on a winter evening must be a very atmospheric experience. We headed back up to the Hadleigh road to return the key. I knocked on the cottage door, and the churchwarden opened it. We chatted for a while about how lovely the church was, and I suddenly had a dawning realisation that the headstop beside the south doorway was a spitting image of the man to whom I was speaking! I said goodbye, and turned to go, but couldn't resist turning back to ask if it was him. He smiled quietly, and shook his head; but then he observed, in the broadest of Suffolk accents, "That may well be, indeed that may well be", and he closed the door behind him.